If I tell you how many cards I carry, you just might unfriend me. Here are my favorite cards that I use myself. I will try and update this every so often. Word to the wise…always make sure you have the latest and greatest offer. These offers do change from time to time. DaddyTravels would truly appreciate it if you use the links provided. These are perfect starter cards that will give you lots of bonus point for travels. As always, you might be targeted for a better offer, and you might consider looking at your options and find what’s best for you. These are the perfect starter cards that could easily get you 2 FREE roundtrip tickets from anywhere in the US to NYC or Hawaii, or just about anywhere in the world. Both cards will allow you to earn 50,000 bonus points, the difference lies on the benefits of the cards and the annual fee. $300 Annual Travel Credit (airfare, bus, taxi, Uber, subway, anything travel related will be covered by this travel credit. For details on the difference, click here….. 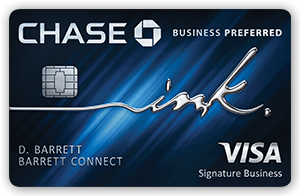 If you have a SMALL BUSINESS, you can also get 80,000 Ultimate Rewards points by applying for a Chase Ink card...I love this card! You can pay your cell phone bills, internet, travel, advertising, shipping purchases….and you earn 3x per dollar. The annual fee is $95. With American Express Platinum, you earn 60,000 Membership Rewards good for air, hotel transfers, $100 Global Entry application credit, $200 Airline travel credit, $200 Uber credit, Priority Pass lounge access, and so much more! This one is another favorite!!! This card also gives you access to using Amex Concierge service, the service that was able to get me tickets to Hamilton NYC and we sat in the 3rd Row Orchestra. Annual fee is $550. There could be better offers on this card, so check first before applying. NEW offer from American Express – this is Amex Blue Business Plus. Currently offering 10,000 Membership Rewards points after you meet $3,000 in purchases within the first 3 months. Best part? $0 NO annual fee. This Chase Hyatt card was the card that got us FREE rooms at Park Hyatt Paris-Vendome, Park Hyatt Paris, Park Hyatt New York, and a Presidential Suite upgrade at the Grand Hyatt Washington DC. You get 40,000 bonus points with this card. There’s a $75 Annual Fee….but you also get a free night every anniversary year at any Hyatt that is between Category 1-4. This one is a keeper for me. Another set of cards that I love are the American Express SPG Business. and American Express SPG Personal. which in our case, gave us 5 free nights in NYC’s Westin Element Times Square West. The current offer is 35,000 SPG points for the SPG business, and 25,000 SPG points for the SPG personal. The next card, I’ve used many times to get free rooms in Milan, Hawaii, San Diego, and New York City. The Marriott Card by Chase is great for FREE hotel stays – Chase Marriott Rewards. Sign up bonus is 80,000 points. Lastly, for more FREE hotel stays, the American Express Hilton Honors card where you can earn 65,000 bonus points – great for Hilton brand hotels worldwide.